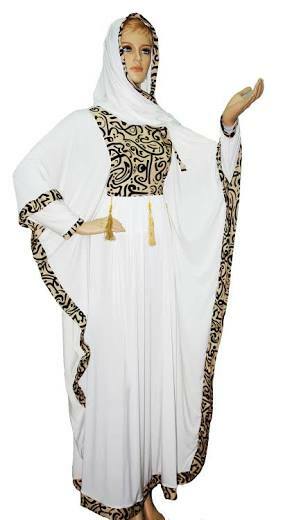 White Khamsa Abaya made from Fezon.That Abaya is Printed with gold color Arabic Letter on Front and on Back with a scarf from the same material and with the same printed decor. Black Khamsa Abaya made from Fezon.That Abaya is Printed with gold color Arabic Letter on Front and on Back with a scarf from the same material and with the same printed decor. The Robe is one size fits to all sizes from L to 4XL.